Andres Noe comes each week to our Las Alitas center with his grandma and his sister to attend weekly religious education classes. His parents don’t come because they both have to work. Andres is the sweetest boy and is very close to Jesus. 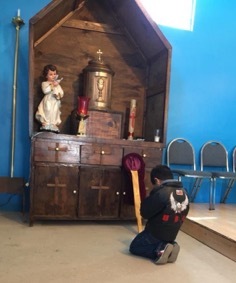 He often goes and kneels before the tabernacle, spending time in prayer while his friends run outside to play. The grandma said, “What did you ask Him?” Andres didn’t reply but seemed relieved and happy. He skipped outside to play with the other kids. Oh, the faith of a child!